With a floating garden that overlooks Singapore's glitzy waterfront from about 200 meters in the air, the Marina Bay Sands is an architectural showstopper. It is also a massive US$5.7 billion bet on the future of Asian gambling. Developer Las Vegas Sands Corp. and its chairman, Sheldon Adelson, have created ambitious casino-resorts in the past, but none quite like Marina Bay, which industry observers—and Mr. Adelson himself—are comparing with iconic regional landmarks such as the Sydney Opera House and Kuala Lumpur's Petronas Towers. Analysts say Marina Bay, which opens Tuesday, could become the world's most lucrative casino. That optimism underscores the growing prominence of Asia for a casino industry with limited prospects in Las Vegas, Atlantic City and other U.S. markets. With Marina Bay set to open Tuesday and rival Steve Wynn's Encore at Wynn Macau opening last week, two of the gambling industry's biggest competitors now rely on Asia for the majority of their revenues. A third, MGM Mirage, decided last month to sell its stake in an Atlantic City, N.J., property in order to maintain a foothold in Macau, where it has the smallest market share but is keen to expand. After a series of delays, Sands will only open some parts of Marina Bay on Tuesday, with a bigger official opening in June. Still, Tuesday's opening marks a return of optimism for the battered global gambling industry after two years of pain. A celebration in December of MGM Mirage's new $8.5 billion CityCenter project in Las Vegas was tempered with concern it would take business from other casinos. After Sands narrowly avoided filing for bankruptcy-court protection in 2008 and 2009, financing troubles forced the company to halt progress on many of its other projects to focus on Singapore. While Las Vegas remains weak, prospects are now bright in Macau—the world's largest casino market by revenue. In 2009, gambling revenue in Macau was about $14.9 billion, up 9.6% from $13.6 billion in 2008. Las Vegas Strip gambling revenue in 2009 was $5.6 billion, off 9.4% from $6.1 billion in 2008. Macau recorded its two biggest months to date in terms of gambling revenue in January and March, and industry watchers and insiders are salivating at the prospect of a new golden age of gambling in Asian markets. "The Asian market is going to be overpowering and we're just getting started," said Bill Lerner, a casino consultant for Union Gaming Group, which is based in Las Vegas. Mr. Adelson, who had earlier predicted Marina Bay could generate $1 billion in cash a year, last week set expectations even higher. "Not only are our hopes justified, we think we're liable to exceed our own expectations," Mr. Adelson said. To succeed, Marina Bay will have to attract wealthy gamblers to Singapore from neighboring India, Malaysia and Indonesia without siphoning off too much business from Macau, a four-hour plane ride away. Success in Singapore isn't certain. The government banned casinos for decades and is only allowing them in cautiously—imposing a hefty surcharge on its citizens and introducing a system that allows Singaporeans to put their family members, or even themselves, on a blacklist. "Singapore's revenue potential is still a large question mark for investors," said Dennis Farrell, a bond analyst for Wells Fargo Securities. "It's an untested market." Under a government-mandated duopoly, Sands will share the Singapore market with Malaysia's Genting Group, which beat Marina Bay to opening day with its family-oriented Resorts World project on Feb. 14. 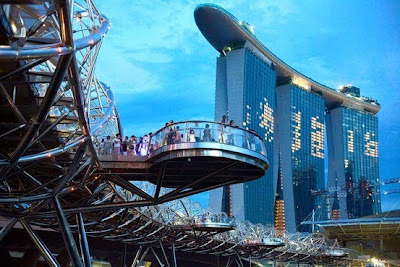 Working in its favor, Marina Bay has a plum location on Singapore's central waterfront and an arresting engineering marvel: a 7,000-ton cantilevered floating garden called a SkyPark that perches atop the project's three 55-story hotel towers. Sands says the public observation deck will be longer horizontally than the Eiffel Tower is tall. No official numbers have been released from Resorts World's 10 weeks in operation. But on a recent Sunday morning, all the blackjack, baccarat and roulette tables on Resorts World's large casino floor were ringed with hordes of gamblers and onlookers, making it difficult to get a seat at any table. Slot machines were also hard to come by, and the two large video roulette theaters were overflowing with gamblers. Another indicator of market appetite: calls to Singapore's National Council on Problem Gambling, which nearly tripled between January and March. So far, 567 Singaporeans have registered with the government body to have themselves blocked from entering the casinos. Credit Suisse analyst Foong Wai Loke projects that the two Singapore casinos will together generate annual revenues of about US$2.6 billion—about 40% of the Las Vegas Strip's US$6.1 billion in 2008. Other industry observers have estimated a market of US$3 billion to US$3.5 billion a year. Mr. Adelson predicts "an almost inexhaustible supply" of gamblers from Malaysia, Indonesia, Thailand, India, China, Vietnam and Australia. Marina Bay will need time to ramp up. When the company announced the opening date in February, it still didn't know what would be ready for the soft opening in April. Now, company spokesman Ron Reese said the company expects to open the casino floor, about one-third of the project's 2,500 hotel rooms, 10% of its shops and half its restaurants. —Sam Holmes in Singapore contributed to this article. SINGAPORE: With just one day to go before phase one opens to the public, Marina Bay Sands has received its casino licence. There had been speculation the licence would not be issued in time. The casino is one of several attractions to open, along with dozens of retail shops and restaurants and getting there will be easy, with a range of transport options available. With parking at Marina Bay Sands starting at S$8 an hour and a new ERP gantry leading to the area, visitors might be better off leaving the car at home. The Electronic Road Pricing gantry is located at Bayfront Avenue, a new road just outside the integrated resort and will be switched on from April 26. So why not take the bus instead? Eight public bus services by operators SBS Transit and SMRT have been re—routed to stop at Bayfront Avenue, a new road just outside the integrated resort. Services include 97 from Jurong East, 133 from Ang Mo Kio Interchange and 106 from Bukit Batok. Visitors can also take the train, stopping either at Marina Bay station on the North—South Line or at Promenade Station on the new Circle Line. The integrated resort is just a short walk away and with the opening of The Helix bridge, visitors are now able to cross the bay in style. The pedestrian walkway runs parallel to the Bayfront Bridge, a new vehicular bridge that connects Marina South to the rest of the Marina area. Coaches from Malaysia will also stop at the resort and there will be a shuttle service to and from the airport. Taxi companies have so far not announced any surcharge for pick—ups from the resort.